Cable cutting and crimping tools manufactured by Cembre are used to cut or crimp most types of low, medium and high voltage cables including EPR, PILC, XLPE, PVC insulated cables with copper or aluminium conductors, lead sheath, steel wire armour (SWA) or wire braid. Cembre tools are used for cutting and crimping underground cables or overhead lines to support the installation of LV-HV power cables and conductors into switchgear, substations, transmission and distribution networks – tools are the highest quality for the compression of connectors, lugs and joints in high voltage electrical cable installations in both indoor and outdoor locations up to 33kV. 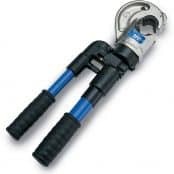 Cembre tools and connectors enable cutting and crimping of cables for installation of glands, joints and terminations including 11kV-33kV. Cable lugs suitable for connection of 11kV-33kV power cables with copper or aluminium conductors to MV-HV electrical equipment including switchgear, transformers and control panels – complete range of Cembre connectors and splices for cable jointing and terminating are available to suit low, medium and high voltage cables including power, control and instrumentation. 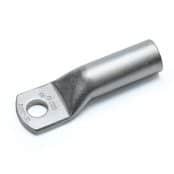 HV cable lugs are available as single/double hole types, suit 16-1000sqmm cables, manufactured from annealed high purity copper tube for crimping cables and are compatible with cold shrink or heat shrink cable terminations. T&D distribute Cembre cable crimping and cable cutting tools including hydraulic, ratchet, mechanical and battery powered tools used in the oil and gas, utilities, renewable energy, petrochemical, offshore, mining and rail networks. Thorne & Derrick provide competitive prices and fast delivery from stock for the complete range of Cembre connectors, cable cutting and crimping tools.